The last day we will be covering for the Summer Television Critics Association press tour this year will be FOX, a network that just appointed new people in charge and restructured things. 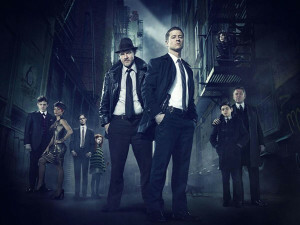 They also have some high-profile new series coming this Fall, including Gotham, Red Band Society, and Gracepoint. Peter Rice hosted the Executive Session and talked up the network’s new structure. Then he fielded questions. – Mulaney has shot six episodes. Rice says that John Mulaney has a “unique voice” and that is captured in the first six episodes. FOX has ordered an additional 10 episodes. – There has not been a “specific conversation” about another year of 24 yet. Rice hopes this is not the last year for Bones, although, it is the last year David Boreanaz and Emily Deschanel are contracted. “I think Glee’s one of the great shows in television history. It touched so many hearts, and it burned so hot & so fast,” Peter Rice said. FOX wants the show to go out in away that celebrates it, and going out in a straight run is a better way to finish the show. The Gotham panel was up next, with Cory Michael Smith (Edward Nygma/The Riddler), Camren Bicondova (Selina Kyle/Catwoman), Robin Lord Taylor (Oswald Cobblepot/The Penguin), Jada Pinkett Smith (Fish Mooney), Donal Logue (Harvey Bullock), Ben McKenzie (Jim Gordon), and Executive Producers Bruno Heller and Danny Cannon. Heller spent a lot of time talking about how Batman is a myth that has endured. He also mentioned that he’d like DC’s Geoff Johns to write for the show at some point. The Mulaney sizzle reel has the overplayed “Best Day Of My Life” song and an overzealous laugh track. However, the show has Martin Short and Elliott Gould, so it has some good things in it. Comedian John Mulaney stars. Family Guy and The Simpsons are crossing over! FOX showed a brief promo from the event, and it looks pretty hilarious. Described as a “coming-of-age dramedy about a group of rule-bending friends and the adults who mentor them through strong friendships, and first loves, to humorous mishaps and heartbreaks.” Creator/EP Margaret Nagle promises backstories for every character, and shares that in situations like these, 85% of kids with these diseases live, so hopefully this wouldn’t be depressing. This new reality show will air two nights a week (Tuesdays and Fridays) and is based on a popular Dutch format. Basically, the concept is a final group of 15 (or so) people create a new “society,” and different folks including a Tea Party member and an Earthy botanist lesbian will work together. 5000 people applied to be in the show, which they will do for a year. 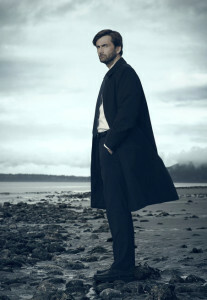 Doctor Who star David Tennant, who played the lead role in Broadchurch, stars in the American adaptation of Broadchurch, titled Gracepoint. Critics asked about differences and similarities to the source material, and the producers have promised that it will deviate. War is coming, in the form of John Noble. The producers are already breaking episode 11, and Episode 7 is currently being shot. Sleepy Hollow will have 18 episodes – that’s five more than last year. The cast is fine with the show’s out-there stories. “There’s not really a shark to jump, because in the pilot we kicked the shark in the teeth!” Tom Mison exclaimed. To talk comedy, FOX enlisted (RIP Enlisted) Elizabeth Meriwether (creator/EP of New Girl), Mindy Kaling (creator/EP/star of The Mindy Project), Dan Goor & Mike Schur (co-creators/executive producers of Brooklyn Nine-Nine), Will Forte (creator/writer/executive producer of upcoming series The Last Man on Earth), Al Jean (executive producer of The Simpsons), Rich Appel (executive producer of Family Guy), and Loren Bouchard (creator/EP/writer of Bob’s Burgers). The different panelists talked about their idols, and it was confirmed that the Family Guy season premiere will be a Simpsons crossover. Next, on September 28, The Simpsons will be killing off a character. Finally with more Simpsons news: A Futurama crossover is set for November.